Been waiting a while for this and now it is out. Finally, a b album released on lovely vinyl/cd (or easy-to-carry mp3/flac). 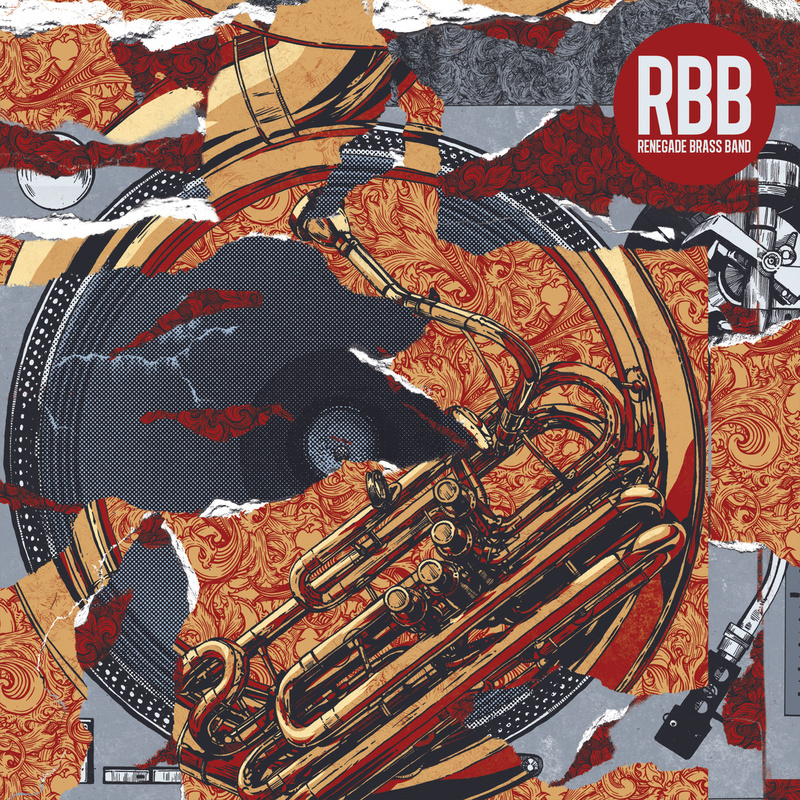 8 songs make up RBB: Rhymes, Beats & Brass, a coiled musical snake ready to pound into attack. Half of the songs are instrumentals, half are graced with the tight rhymes of V3xation, the band’s MC. Some you knew in a former life, some are new. Lyrical themes? Life gone wrong (it happens), political statements and even the NHS situation are seeds that feed the Gestalt-like entity to further push The Message from their lyrical sheets to your speakers. ‘This shall not stand’ is both a wordless statement and the album opener. With equal parts of funk, latin jazz, and classical brass band sounds, the song heralds the arrival of Renegade Brass Band, with some well placed scratches spicing up the proceedings. I guess the association of Latin music and wind instruments is perfectly reflect in ‘Barrio’, the upbeat track that holds the fort mid-album. ‘The Shakedown’ is more of an urban track; heavy on the sousaphone, easy going on the rhythm and overboard with the stylish jazzy sounds, the ones revisited later on ‘Junktion’. There’s a bit of homespun knowledge in the acrid flow in ‘Take no chances, make no changes’, a song with a good message that sometimes gets lost and it’s only seen in hindsight. Another good anecdote comes in ‘Just Business’. “At the end of the day, it’s just business / Some might say that fate’s a cruel mistress / Got the widest of grins on straight faces, / Handshakes and stakes in our interest.” Well, sometimes you try your darndest and still things won’t work out. It happens and you gotta remember it’s not personal, it’s just business. ‘Folding money’ talks about the NHS woes, the ones that are many and are pretty dire. The song is quite upbeat and the lyrics aren’t; a contradiction that moves it forward like the clashing wind currents that create an eddy. ‘Zealots’ feels even starker, with tales about demons pulling you into opposite ways. It’s a sombre, almost cruel way to finish what could appear to be a “party album” but what really is a funky vehicle for a message. Sometimes, you just need to sweeten the pill. Think of RBB: Rhymes, Beats & Brass as a political activist that found a very good way to make his message palatable and even better, hook-laden. Posted in Apocalyptic stuff, reviewsTagged Brass Bands, RBB, Renegade Brass Band, Sheffield, YorkshireBookmark the permalink.